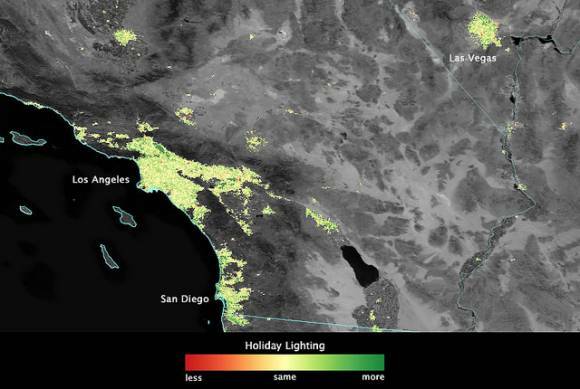 This could be the thing that counteracts humanity's collective seasonal affective disorder: NASA just released new images from its Suomi NPP satellite, showing that nighttime lights burn visibly brighter during the holiday season. The difference can be seen in cities across the U.S., where, starting on Black Friday and continuing through New Year's Day, urban centers shine 20 to 30 percent more brightly. The effect is even more pronounced in the suburbs, where light intensity increases anywhere from 30 to 50 percent. "It's a near ubiquitous signal. Despite being ethnically and religiously diverse, we found that the U.S. experiences a holiday increase that is present across most urban communities," Miguel Román, who co-lead the research, explained. "These lighting patterns are tracking a national shared tradition." The researchers also observed nighttime light strengthening in Cairo during the month of Ramadan. In that case, the phenomenon appears to arise not from people adding string lights to their homes, but because many people shift their activities to the evening, once their daily fast has ended. 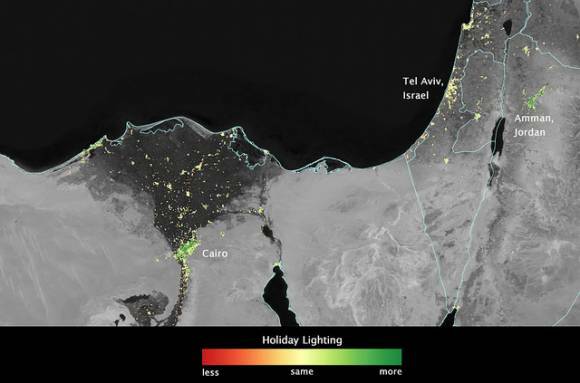 The change wasn't ubiquitous, however: in regions with unrest or unstable electrical grids, such as in Syria, Iraq and Lebanon, or even in the most poor or devout areas of Cairo, Ramadan wasn't associated with extra light use. 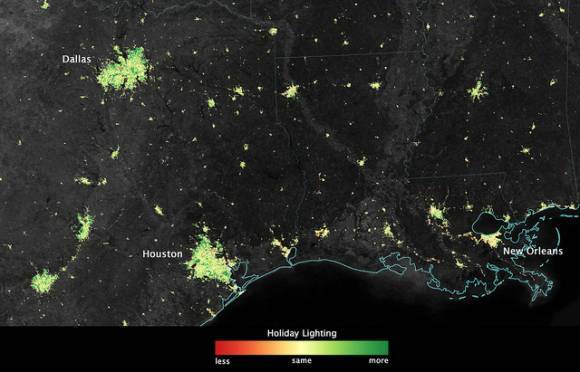 That gets to the real goal of NASA's work, which is not so much to spread holiday cheer as it is to monitor our electricity use, forming a better understanding of our energy demand. "More than 70 percent of greenhouse gas emissions come from urban areas," Román said. "If we're going to reduce these emissions, then we'll have to do more than just use energy-efficient cars and appliances. We also need to understand how dominant social phenomena, the changing demographics of urban centers, and socio-cultural settings affect energy-use decisions."